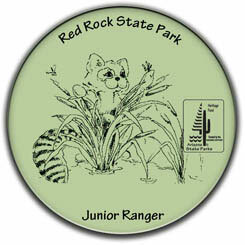 If you're between ages 6–12, you can become a Junior Ranger at Red Rock State Park! Pledge to do your part to help preserve the beauty of the park for everyone to enjoy! Rules Are Tools! 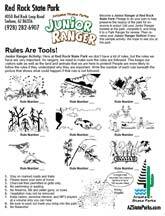 : Here at Red Rock State Park we don’t have a lot of rules, but the rules we have are very important. As rangers, we need to make sure the rules are followed. This keeps our visitors safe as well as the land and animals that we are here to protect! People are more likely to follow the rules if they understand why they are important. Write the number of each rule beneath the picture that shows what could happen if that rule is not followed. 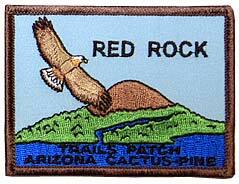 The Girl Scout Councils of Arizona have approved the following Interest Project Patch for Red Rock State Park. Learn more from the Arizona Cactus-Pine Girl Scout Council and the Sahuaro Girl Scout Council.